Call to order by President Gar Demo at 7pm. A motion was made and seconded to approve the minutes. Motion passed. Busy kicking off the new semester. For the most part we are on budget. We spent a little more on merchandise, but had more income from the merchandise. We are slightly over budget on food because of an extra meal for the stadium rehearsal barbeque. In general, we are about $6,000 ahead because of some larger gifts and corporate matching of gifts. A motion was made and seconded to approve the financial report. The motion passed. There will be a link to Signup Genius for helpers for the silent auction that will be sent in the next few days. We need help for both the meal and the silent auction. Carol Keeney requested auction items including specific items, baskets, and gift cards. Please donate all items by February 10-11. Volunteers are needed in two-hour shifts. Last year we raised over $10,000. Please bring family and friends. There is a need for a chili cooking apprentice to shadow this year. There is also a need for a parent of a younger student to apprentice with the auction this year. An auction donation form was included in the meeting handout and is also available online. We will be recruiting for board positions in March. The uniform process will be streamlined because of the new uniforms this year. There is also new software to manage the uniform process. If you are interested in serving on the board, please contact Gar Demo, GarDemo@gmail.com, or any current board members. It will be in the spring. More information will come at a later date. Gar talked about the calendar that was handed out in the packet at the meeting. A band trip packet was handed out to everyone. We work with a planning company that lines up all the trip details. The cost will be $1,900 to $2,000. Every effort will be made to lower the cost. A payment schedule was included in the packet. Because the band is a 501c3, it limits individual fundraising efforts. The Band Boosters typically makes a donation to the cost of the trip. The amount will be decided at a later date when we are closer to the end of the fiscal year. There will be ways that students may help with fundraising. Trip information and forms will be posted on the website as soon as they are available. Let Gar know if you are interested in helping to plan the trip. Details of hotels and activities have not yet been decided. Cindy Ridgway is the trip treasurer. There was discussion about the cost of the trip and the decision to fly rather than taking a bus. The cost of the airfare would not give as much savings over a bus. Two performances are planned: one in Disney and one in Epcot. The band will not participate in a parade. The hotel will not be in the park because of safety issues. There will be approximately 12 chaperones. There will be a series of trip meetings in February. You only need to go to one of the meetings. More information will be distributed at that time. The kids loved the variety of snacks on the trips. The light show has been cancelled for next year. It will be reconsidered for the following year. The kids loved the Chipotle. It was more expensive. Thank you to all of the volunteers for all the help with the band events. Percussion camp will be July 23-25. New marcher and leaders’ camp will be July 26-27. Full band camp will be July 30-August 3. ​The meeting adjourned at 7:51pm. Gary Converse, Lisa Wells, Bryan Ridgway, Amy Johnston, Stacey Weirick, Lori Gregor, Gretchen Hollman, and Sophia Hollman. Gar has assembled a Master Calendar with various events listed by time of year, and what needs to be done when. Penny has asked our group for suggestions for a Band Trip Coordinator and treasurer. Our books will be audited in July by outside firm. Discussed ways to collect info at uniform registration – will have computers set up for parents to fill out google form. Future General meetings will be held in August (or end of band camp in July) and January. Future Exec Board Meetings – End of July? And likely immediately before each general meeting. Co-President Kristi Klein asked for a motion to approve proposed 2017-18 Budget. Gar Demo moved to approved budget, Annette Becker seconded. Vote – motion carried. 2017-18 budget will be proposed to general membership. Call to order: 7:05 outgoing co-president Kristi Klein called the meeting to order. She introduced Gar Demo, who welcomed everyone in attendance, especially parents of new band members. He thanked the outgoing board for their service, and asked them to stand and be recognized. He then referred everyone to the slate of 17-18 board nominees in the packet that was passed out, and asked for a motion to elect the slate as presented. Carrie Cloo moved to elect the slate, and Geoff Smith seconded the motion. There was no discussion and the motion carried. Gar spoke about the mission of SMNW Band Boosters, and referred to all of the resources in the packet that was distributed, specifically the calendar and Band 101. Stacey Weirick reviewed the 2016-17 budget, and asked for questions. She then presented the prposed 2017-18 budget. She highlighted the changes in the fee structure, eliminating the extra fee for percussion. Carol Keeney moved that the proposed budget be approved. Thelma Markwart seconded the motion. The Motion carried. Gar went on to talk about our fundraising activities – mainly merchandise (spiritwear), the chili supper/auction, the car wash and restaurant nights He highlighted that we are a 501c3, so cannot fundraise for individual band members. There are many volunteer opportunities – a form can be found in the packet. One of the greatest needs for volunteers will be uniform fitting – watch your email for a signup genius. Many hands make light work! Penny Snead arrived and welcomed everyone. She shared her expectations of the students and is looking forward to a great year. She also stressed that students can be involved in several activities and the school faculty will work with them to resolve conflicts. She introduced Sophia Hollman, Field Captain, Lauren Klein Sr. Drum Major and Evan Wapp, Jr. Drum Major. They had all of the section leaders introduce themselves. Unfortunately, technical difficulties prevented the display of the powerpoint, but that will be shared in upcoming newsletters and on the band website – smnwband.com. Approve Minutes from July 29 General Band Booster Meeting - Booster Minutes are available on the www.smnwband.com. Janna summarized what was on the minutes from the July 29 meeting at SM North. Motion approved by unanimous voice vote. Vote in Stacey Weirick to Treasurer/give treasurer report. Stacey told a little bit about her background in accounting, and that she has a Junior at SMNW. Pizza was served at both festivals, and wraps from Tropical Smoothie Cafe for the Topeka festival. Suggest including dietary needs on forms at beginning of year during uniform checkout. Next year there may be a committee assigned to this, but will probably still use signup genius. One challenge was sending the cases of water bottles and passing them out. Future Events -Restaurant Nights- Johnny’s Tavern 20% donation on Nov. 16, 2016, just mention SMNW Band, and no form is needed. Feb. 15-Auction and Chili Supper - Claudia B. talked about upcoming planning for Auction, Kohls volunteers completed the envelope stuffing, and the requests will go out soon. The auction committee meeting will be next week. Please contact Claudia if you are interested in helping with this event by donating items or any other way (Claudia Basel <chezbaz@gmail.com>). Brett Eichman showed the new equipment that was purchased and played some of them including the new Marimba! Check the www.smnwband.com for any calendar update information. The next meeting date is yet to be determined, but will be after 1/1/2017. A List of Attendees is Attachment 1. President Kristi Klein welcomed everyone (5:45 pm) and introduced herself. Everyone said Ay to approve the minutes. There were no Nays. Kristi stated to look at website to find email address if you are not getting information from band. Look for calendar of events with details at www.smnwband.com. Look for forms, financial information, and Music Changes Lives fundraiser at www.smnwband.com . Additional fundraisers include: Restaurant Nights, Trashbag Sales, Merchandise (available tonight! ): Get your gear!, Auction Night/Chili Supper in February, and most recently the Carwash Fundraiser. Clarinets and Horns - $411- Winners of contest! Total $1464 for this fundraiser. Kona Ice Fundraiser tonight-Free small Kona Ice for Band and Drill Team, Kona Ice is donating 25% of additional sales. That’s it for tonight. Let’s watch the band. President Kristi Klein welcomed everyone to the meeting, and introduced Jared also as co-president. She asked people to raise hands if they had Freshman, Sophomore, Junior and Senior. She mentioned that there were some coupon books to sell for HyVee and Price Chopper. Matt Zimmerman went around and sold many coupon books! Kristi explained some background information about the boosters and the board. expects from students, there is alot of information and the calendar on website (www.smnwband.com OR www.smnwband.org; both work) and with students. Many students are in many activities and all get worked out. The best way to get ahold of her is through email. Penny introduced Ashton Hess, Field Captain, who welcomed everyone and introduced Sophia Hollman, Junior Drum Major, who introduced Greta Christianson, Senior Drum Major. Doug Talley came in and introduced himself as assistant band director. He talked about band equipment, and asked that people see him after the rehearsal about instrument rentals over the summer or for next year. Kristi went on with the slides (slide 8), and talked about Buddy Program, Newsletters (Band Booster News & Updates), contact information (brown sheet), websites: www.smnwband.com OR www.smnwband.org, Facebook­Shawnee Mission Northwest Bands, and Twitter. Kelly Demo then came up to talk about the fundraising opportunities (that are on Slide 13) that take place throughout the year. These fundraisers are to support the band and the musical learning experience throughout the year. Most of the fundraisers have chairpersons already, and will just need help at different times throughout the year. Kristi spoke again regarding volunteers and volunteer sign up (slide 14) on the brown contact sheet. Both Merchandise and Uniforms need a shadow person for this year to take over for next year. Please sign up to work on the different activities listed on the brown sheet. Kristi asked that volunteers from 2015­16 stand up. Thank you to Volunteers for various events in 2015-2016. Kristi re­iterated that it takes a lot of volunteers, and she will also send out some “sign up geniuses. “ A big event coming up on the last day of Band Camp is the Band Performance and Dinner on July 29, and that dinner needs some volunteers. volunteers for July 26­28 for uniform checkout and for July 19 uniform reassembly. There was a list on the stage of times and jobs to volunteer. Michele and John showed the uniform and described its care, and how we do the checkout for uniforms and shoes. They really need someone to take over for next year that can shadow them this year to learn the sequence of events. This also includes symphonic uniforms. Their son is now a senior in percussion. The uniform contract is on slide 16. 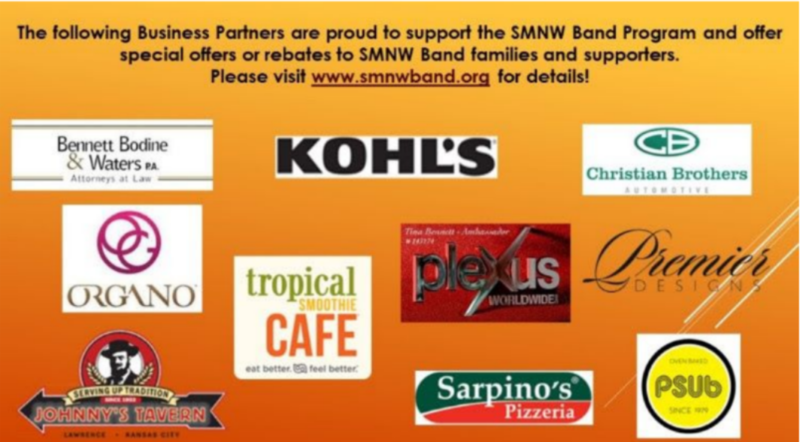 Check the www.smnwband.com for any calendar update information. Everyone finished signing up, turned in contact sheets and went to watch the band. The slides in Attachment 2​ beginning on Slide 4 were for the General Board Meeting.